Thought I would come back on a sweet note :-). Don't have time for dessert? Not to worry, as long as you have the following. I just put together this simple yet very tasty dessert instead of having a plain old cup of ice cream. Put 2 scoops of Vanilla ice cream in a serving bowl. 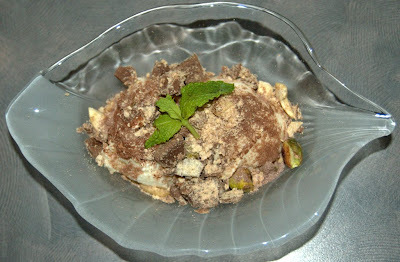 Sprinkle 1/4 tsp of cocoa powder on top, and then add the chopped pistachios and cashews. Crush the Kit Kat chocolate bar and sprinkle on top. Garnish with a few mint leaves on top. Enjoy the yummy concoction. For the best taste, use the best vanilla ice cream and cocoa powder. In my case I used Haagen Dazs Vanilla Ice Cream, and Godiva Cocoa powder.